I didn’t do a whole lot of shopping in this year’s Nordstrom Anniversary Sale… I don’t really *need* anything, and I’m trying to seriously downsize all of my things for the time being. (More on that to come!) However, I couldn’t say no to a few things that I tried on. This dress was one of them, as was this one. Love the mix with the elegant and the sporty pieces! Love it! As soon as I saw the bow I thought Gucci and then kept reading and saw that great minds think alike! You have the best preppy style! 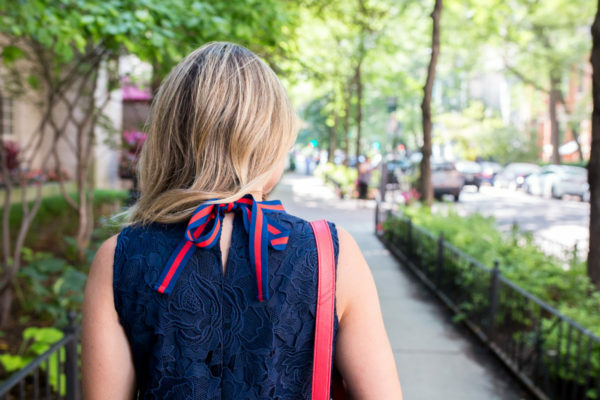 So in love with that ribbon detailing!